All rooms have Wifi, access to TV and DVD, screen, flipchart and pens, fax and photocopying available if needed. Ground floor room for up to 120 delegates with moveable seating and tables in a configuration to suit your needs. Cloakroom and male, female and disabled toilets are situated in the adjoining corridor. This room has plenty of natural light and looks out over our lake. On the first floor this room has space for up to 35 delegates and can be laid out to your specification. 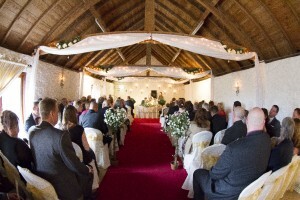 The room is full of character with vaulted ceiling, oak beams and whitewashed walls. Cloakroom facilities are in the corridor at the bottom of the stairs. The lounge area of our charming suite has two comfortable sofas with the distinctive backdrop of the waterwheel. It provides a more personal, private space ideally suited to one to one meetings. 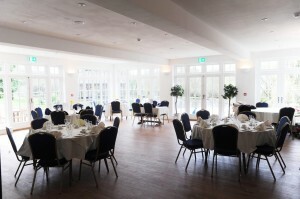 Is a small open-plan function room leading directly onto the corridor opposite the Wheelroom restaurant. 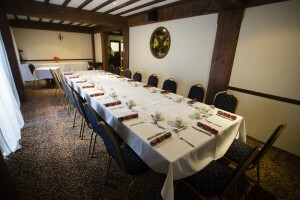 It is full of charm and character and the ideal location for smaller meetings or interviews. 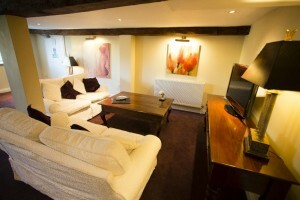 Or simply relax on the sofas in our lounge area where the waitresses are always available to top up your tea or coffee.